Alpha Protocol is a cutting-edge espionage RPG from Obsidian Entertainment and Sega for PC, Xbox 360, and PlayStation 3. Directed by Alexander Brandon and composed mainly by Jason Graves, its score blended cutting-edge orchestral and electronic elements to immersive effect during cinematic and interactive sequences alike. An eight track soundtrack was produced for special promotional purposes and is exclusively reviewed here. “Your Weapon Is Choice” is a defining composition for Alpha Protocol, named after the tagline of the game. During the first minute, Jason Graves establishes a fascinating electronic groove for the score, capturing the espionage feel of the game. Thereafter Graves introduces one of his characteristic piercing brass fanfares and gradually intensifies the composition texturally and rhythmically. The composition undergoes many twists and turns during its five minute development, each time immersing listeners into the game. The second half of the composition, in particular, is subdued yet enigmatic, leaving consumers uncertain about what will come next. The rest of the soundtrack successfully builds on the electro-orchestral elements established on “Your Weapon Is Choice”. The majority of the tracks transition from soft yet tense passages towards a action-packed climax, and vice-versa, as the protagonist Michael Thorton heads to and from combat. The way this is achieved in tracks such as “I’ll Take the Big One” and “A Modern-Day Spy” is absolutely central for creating mood and interactivity in the game. A particularly impressive arch is featured in “C-130 Tailgate Party at 10,000 Feet”. Introduced with Graves’ trademark stabbing strings with pulsating beats, it subsequently undergoes a seven minute cinematic journey through an array of styles and moods. The way Graves prepares the deliciously sinister turns at both 3:04 and 4:57 is especially awe-inspiring. Though the Alpha Protocol soundtrack has a distinctive feel to it, there is still plenty of diversity during its playtime. In addition to the contrasts between tension and action, Graves portrays a range of settings on the title. On tracks such as “C-130 Tailgate…” and “Much Love for the SMG’s”, Graves even introduces some traditional ethnic instruments. Some fan reviewers have criticised the treatment of these elements, but in my opinion unreasonably; their treatment here is authentic, emotional, fitting, and, above all, well-integrated with the electro-orchestral components. A mention is also deserved for “Can’t We Discuss This Like Gentlemen?”, a slow string-based orchestration that is relieving without being overbearing or schmaltzy. It is a lovely way to lead out the score. While this promotional soundtrack release is solely dedicated to Jason Graves’ epics for the score, note that there are also numerous other compositions on the full in-game score. 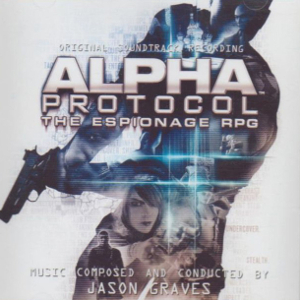 Of particular interest is the main theme for Alpha Protocol, a highly successful electro-orchestral collaboration between DJ BT and symphonist Graves. The theme is featured in several different variations during the game for interactive purposes. In each variation, the theme is built upon a web of electronic breaks that are often punctuated and distorted for edgy effect. Graves’ orchestral elements are equally thrilling with piercing brass leads and momentous string build-ups. Together they ensure the main theme is an immersive and dynamic accompaniment to the espionage. This sampler testifies to the quality of Alpha Protocol‘s score. Jason Graves, in collaboration with Brandon and BT, really pinpointed the sound required for the game and successfully developed it for all sorts of purposes. The way electronic and orchestral elements are combined is stunning, both from a technological and compositional perspective, throughout. Let us hope that, one day, the Alpha Protocol soundtrack is officially released.